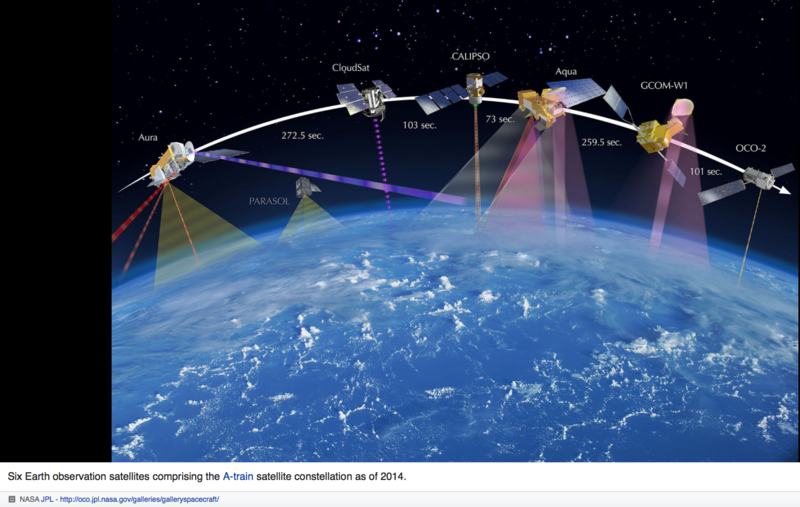 Earth observation satellites are satellitesspecifically designed for Earth observationfrom orbit, similar to spy satellitesbut intended for non-military uses such as environmentalmonitoring, meteorology, map makingetc. The first occurrence of satellite remote sensing can be dated to the launch of the first artificial satellite, Sputnik 1, by the Soviet Union on October 4, 1957.Sputnik 1 sent back radio signals, which scientists used to study the ionosphere.NASA launched the first American satellite, Explorer 1, in January 31, 1958. The information sent back from its radiation detector led to the discovery of the Earth’s Van Allen radiation belts.The TIROS-1spacecraft, launched on April 1, 1960 as part of NASA’s TIROS(Television Infrared Observation Satellite) Program, sent back the first television footage of weather patterns to be taken from space.As of 2008, more than 150 Earth observation satellites were in orbit, recording data with both passive and active sensors and acquiring more than 10 terabits of data daily. Most Earth observation satellites carry instruments that should be operated at a relatively low altitude. Altitudes below 500-600 kilometers are in general avoided, though, because of the significant air-dragat such low altitudes making frequent orbit reboostmaneuvres necessary. The Earth observation satellites ERS-1, ERS-2and Envisatof European Space Agencyas well as the MetOpspacecraft of EUMETSATare all operated at altitudes of about 800 km. The Proba-1, Proba-2and SMOSspacecraft of European Space Agency are observing the Earth from an altitude of about 700 km. The Earth observation satellites of UAE, DubaiSat-1& DubaiSat-2are also placed in Low Earth Orbits (LEO)orbits and providing satellite imageryof various parts of the Earth. To get (nearly) global coverage with a low orbit it must be a polar orbitor nearly so. A low orbit will have an orbital period of roughly 100 minutes and the Earth will rotate around its polar axis with about 25 deg between successive orbits, with the result that the ground trackis shifted towards west with these 25 deg in longitude. Most are in sun-synchronous orbits. Herman Potočnikexplored the idea of using orbiting spacecraft for detailed peaceful and military observation of the ground in his 1928 book, The Problem of Space Travel. He described how the special conditions of space could be useful for scientific experiments. The book described geostationarysatellites (first put forward by Konstantin Tsiolkovsky) and discussed communication between them and the ground using radio, but fell short of the idea of using satellites for mass broadcasting and as telecommunications relays. GOES-8, a United Statesweather satellite. A weather satellite is a type of satellitethat is primarily used to monitor the weatherand climateof the Earth.These meteorological satellites, however, see more than cloudsand cloud systems. City lights, fires, effects of pollution, auroras, sand and dust storms, snowcover, icemapping, boundaries of ocean currents, energyflows, etc., are other types of environmental information collected using weather satellites. Other environmental satellites can assist environmental monitoringby detecting changes in the Earth’s vegetation, atmospheric trace gas content, sea state, ocean color, and ice fields. By monitoring vegetation changes over time, droughts can be monitored by comparing the current vegetation state to its long term average.For example, the 2002 oil spill off the northwest coast of Spainwas watched carefully by the European ENVISAT, which, though not a weather satellite, flies an instrument (ASAR) which can see changes in the sea surface. Anthropogenic emissions can be monitored by evaluating data of tropospheric NO2 and SO2. These types of satellites are almost always in Sun synchronousand “frozen”orbits. The Sun synchronous orbit is in general sufficiently close to polar to get the desired global coverage while the relatively constant geometry to the Sun mostly is an advantage for the instruments. The “frozen”orbit is selected as this is the closest to a circular orbit that is possible in the gravitational fieldof the Earth. Terrain can be mapped from space with the use of satellites, such as Radarsat-1and TerraSAR-X.